Have mercy, holy martyrs Cyprian, Justina, and Theoctistus: for your love is undying. Have mercy, for many people today are deceived by evil practices of witchcraft and sorcery. Have mercy, for the devil useth tricks and disguises to entrap and dominate both the ungodly and the Christian. Have mercy, for Jesus Christ kneweth that the devil desired the downfall of the holy Apostle Peter. Have mercy, for the enemy of mankind despised Saint Peter’s dedication to the Only Son of God. Have mercy, for the holy Apostle Paul warned the Ephesians that we struggle against wicked principalities. Have mercy, for the devil trieth to sway individuals and also entire communities for his evil purposes. Have mercy, for Saint John Chrysostom said that Satan grieveth when a person is delivered from sin. Have mercy, for only the repentant can enter the Kingdom of Heaven and enjoy eternal life. Saint Justina, thou wert also brought up in a pagan household, but thou becamest a Christian and then converted thy parents to the True Church. Young in years but strong in faith, thou didst devote thyself to a life of prayer. Thou didst continually crucify thine impure passions and desires, and lived virtuously for the sake of thy Lord and Savior, Jesus Christ. Thine home became a sanctuary of unceasing worship, and everyone in it said: Alleluia! Have mercy, new convert to Christianity and a blessing to thy mother. Have mercy, young follower of Jesus Christ and a revelation to thy father. Have mercy, first in thine household to hear the Gospel and first to be martyred. Have mercy, first in thy family to make the Sign of the Cross and first to repel the demons. Have mercy, Christian in the city of Antioch and stranger to places of temptation. Have mercy, worshipper in the Church of Christ and foreigner to temples of idols. Have mercy, eager recipient of the glad news and deaf mute to evil murmurings. Have mercy, golden vessel of the virtues and brick wall to unbefitting influences. 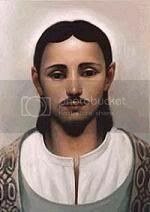 In thy dedication to a life of prayer, Saint Justina, thou didst refuse a marriage proposal from a conceited young man who was attracted to thy beauty and the excellence of thy character. He deemed thee suitable to become his bride, not understanding that thine honorable conduct resulted from thy conversion to Christianity. It was the True Bridegroom of the True Faith Who had transformed thee into a fragrant flower of blessings. Therefore, in faithfulness to God’s calling, thou didst say: Alleluia! 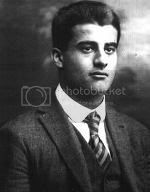 Have mercy, for the faithful continue to preserve thy memory from one generation to the next. Have mercy, for the persecuted arise to sainthood from every manner of Christian living. Have mercy, for a pure heart is the acceptable habitat of God’s love. Have mercy, for God showeth no bias toward the social status of persons. Have mercy, for the gifts of God are diverse and in accordance with His Wisdom and mercy. Have mercy, for the martyrs prove that all Christians are to be righteous and faithful. Have mercy, for abundant reward is given to all who do the will of God. Have mercy, for Heaven awaiteth those who glorify Him here on earth. 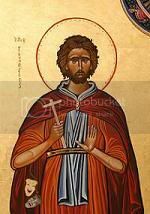 Saint Justina, the menacing young man insisted upon taking thee for his wife. Furious and spiteful, he went to a warlock and paid for a spell to be cast upon thee. 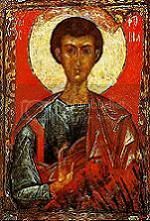 That warlock was Saint Cyprian, who was renowned throughout Antioch for his knowledge of sorcery and his actual contact with the devil and hordes of demons. Thou wert to encounter vicious attacks, Saint Justina, but through prayer and fasting thou wouldst continue to say: Alleluia! Have mercy, for we are surrounded by false images of pleasure and power in every facet of our daily living. Have mercy, for we are admonished by foolish experts to be tolerant of moral deviations and all manner of evil. Have mercy, for there are some who rewrite the Scriptures to suit their evil and unholy inclinations. Have mercy, for there are others who dismiss the holy fathers and mothers in order to scatter and not to gather. Have mercy, that our instinct may always be to rely upon God for help. Have mercy, that our response may always be repentance and prayer. Have mercy, that our purpose may always be to please God and serve Him. Have mercy, that our disposition may always be humble and meek. Although thou wert the object of obsession and the target of attack, thou didst overcome all evil by making the Sign of the Cross. This sent the pagan priest Cyprian into a violent rage. He summoned the demons for more attacks – this time, attacking thy parents and relatives, as well as friends and neighbors. He afflicted them with diseases, including their animals, causing sorrow and lamentation. Saint Justina, thou wert also stricken horribly ill, but thou turnedst to the Psalms for comfort, and said: Alleluia! Have mercy, for during all suffering thou didst remain centered in thy life of unceasing prayer. Have mercy, for during all hardship thou didst never waver in thy dedication to Christ. Have mercy, for while calamity invaded the city, thou didst remain focused on the authority of God. Have mercy, for while destruction fell upon all living things, thou didst never succumb to Satan. Have mercy, for thou leddest the people to the True God by thy powerful prayers. Have mercy, for thou didst turn their grief into celebration. Have mercy, for thou rosest from thy bed of sickness by thy faith. Have mercy, for thou didst receive grace in every circumstance. 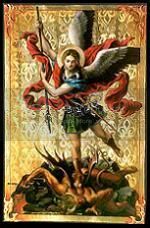 Saint Cyprian, through the marvelous powers of the God of the Christians, and therefore through Saint Justina, thou wert able to observe and experience the inferiority of the devil and his devices. Yes, Saint Cyprian, thou thyself hadst been greatly deceived and cheated by the enemy of mankind. Upon the depletion of thy sorcery, thou didst criticize Satan to his face for his inability to win the spiritual war against Saint Justina. This was a turning point in thy life, for thou wouldst soon hasten to the True God, and thou wouldst say: Alleluia! Have mercy, defeated in battle by the holy Saint Justina and triumphant over the forces of evil. Have mercy, scorned by the city of Antioch and uplifted from the domain of darkness. Have mercy, attacked by the enemy of mankind and delivered by the God of Saint Justina. Have mercy, exhausted of evil curses and invigorated by the Sign of the Cross. Have mercy, that we give no opening to Satan. Have mercy, that we never have recourse to evil enchantments. Have mercy, that we learn from the saints and martyrs. Have mercy, that we trust only in the True God. In thy state of profound repentance, Saint Cyprian, thou didst gather up all thy books of sorcery and asked the bishop to burn them and to baptize you into the True Church. Although thou mettest with distrust, thine heartfelt weeping over thy sins convinced the bishop of thy sincerity. Thou were baptized, then ordained a true priest of the True God, and later becamest a bishop. Meanwhile, Saint Justina had entered a monastery. It was thy great honor to ordain her a deaconess, and then thou didst appoint her the abbess. In all things thou didst continually praise God, and said: Alleluia! Have mercy, for the devil wageth war against Christians to this day. Have mercy, for the evil one also trieth to obstruct the conversion of souls. Have mercy, for there are devious people who manipulate our weaknesses. Have mercy, for there are profane books and divers arts which entice the unguarded. Have mercy, for the lust for power is in defiance of the sovereignty of God. Have mercy, for the desire for fame is in opposition to the Christian virtues. Have mercy, for we need to be reminded of our upward calling. Have mercy, for we wish to be found holy in the sight of God. The governor of Antioch ordered Bishop Cyprian and Abbess Justina to be tortured. In their refusal to denounce Jesus Christ, the governor finally decided to kill them by plunging them into a cauldron of boiling water. The saints prayed fervently and, miraculously, were not harmed. A pagan priest arrogantly thought that he also could be submerged into the water without harm. Calling upon a pagan god to protect him, he hurled himself into the cauldron and was scalded to death. In wonderment at this vivid contrast between truth and falsehood, we all say: Alleluia! Have mercy, martyrs of Nicomedia and citizens of Heaven. Have mercy, knowers of truth and habitats of love. Have mercy, resented by demons and venerated by the Church. Have mercy, despised by pagans and admired by Christians. Have mercy, united in Christ and fruitful in service. Have mercy, joined in worship and generous in blessings. Have mercy, members of the Body and bearers of the Cross. Have mercy, friends of the saints and teachers of mankind. There was a soldier, Theoctistus, who looked on as Saint Cyprian and Saint Justina were being tortured. Moved by their faithfulness and called forth by the True God, Theoctistus declared himself a Christian and was straightway martyred with them. Their bodies were left unattended for six days. Then, some unidentified Christians collected the bodies and transported them to Rome for burial. A kindly Roman woman called Rufina gave the three martyrs a proper Christian funeral. People then obtained healings at their gravesites, and we today also pray to be delivered from evil and strengthened in faith. Alleluia, Alleluia, Alleluia! Let us declare ourselves Christians: receiving the blessings, facing the consequences, and always trusting in the True God to lead us to spiritual victory. This is an experimental prayer for those suffering from drug or alcohol addiction. It is designed to be prayed for another person, but can of course be prayed for oneself, with a little adjustment to the wording. As this is still a draft, I would welcome any feedback you may have at this time. ℣. In the name of the + Father, and of the Son, and of the Holy Spirit. ℟. And my mouth shall declare Thy praise. ℟. O Lord, make haste to help me. ℣. Glory be to the Father, and to the Son, and to the Holy Spirit. ℟. As it was in the beginning, is now, and ever shall be, world without end. Amen. Antiphon. Know ye not that your body is the temple of the Holy Spirit, who is in you, whom ye have from God, and ye are not your own? mine eye is consumed with grief, yea, my soul and my belly. my strength faileth because of mine iniquity, and my bones are consumed. Blessed is the man that endureth temptation: for when he is tried, he shall receive the crown of life, which the Lord hath promised to them that love him. Let no man say when he is tempted, I am tempted of God: for God cannot be tempted with evil, neither tempteth he any man: But every man is tempted, when he is drawn away of his own lust, and enticed. Then when lust hath conceived, it bringeth forth sin: and sin, when it is finished, bringeth forth death. ℟. Pour forth Thy glory upon us. Hear me, O Father, Father of all fatherhood. I invoke you yourselves, ye forgivers of sins, ye purifiers of iniquities. Forgive the imperfections of the souls of all who seek after the Light. Purify their faults and weaknesses, and make them worthy to be reckoned with the kingdom of the Father of the Treasury of the Light. Hear me, invoking you, forgive the imperfections of these souls and blot out their faults and weaknesses. Let them be worthy to be reckoned with the kingdom of the Father of the Treasury of the Light. Forgive the imperfections of these souls, blot out their iniquities which they have knowingly and unknowingly committed unto this day; forgive them then, and make them worthy to be reckoned with the kingdom of the Father. May they be healed and made ready vessels to receive the Gnosis of Love, Life, Liberty, and Light. Amen. Let us pray. O God of mercy, we bless Thee in the name of Thy Son, our Lord the Christ, who ministered to all who cameth to Him. 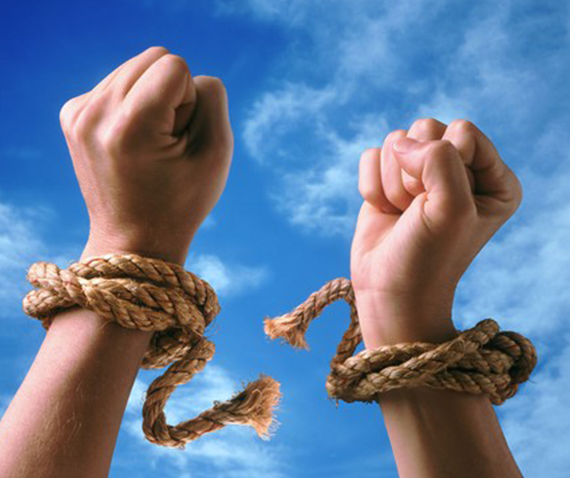 Give Thy strength to (name of the one you are praying for), who is bound by the chains of addiction. Enfold him/her in Thy love and restore him/her to freedom through Thy grace. Lord, look with compassion upon all those who have lost their health, and have broken relationships because of their attachment to the object of their addiction. Restore to them the assurance of Thine unfailing mercy, and strengthen them in the work of recovery. To those who care for them, grant patient understanding, and a love that perseveres. Lord, in Thy servant, the holy Matt Talbot, Thou hast given us a wonderful example of triumph over addiction, of devotion to duty, and of lifelong reverence of the Blessed Sacrament. May his life of prayer and contrition give (name of the one you are praying for) the courage to take up his/her cross, and follow in the footsteps of our Savior, our Lord the Christ. Amen. ℟. Who hath made heaven and earth. ℟. Who filleth the earth with Her sweetness. ℣. May the Lord grant us His peace. ℟. And life eternal in the Fullness. Amen. ℣. 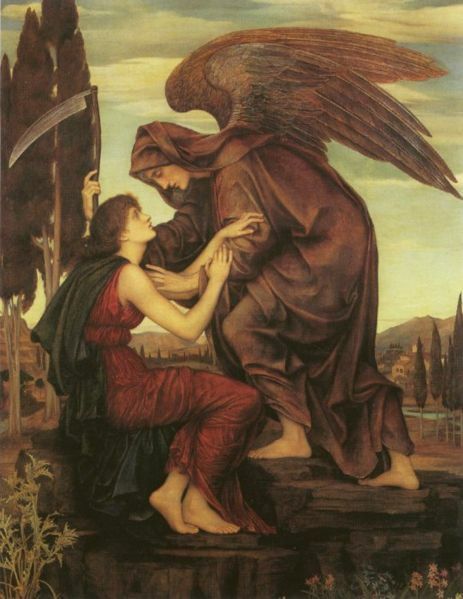 May Divine aid toward Gnosis remain with us always. Holy Sophia, pray for us. Holy Michael, pray for us. Holy Martin, pray for us. Holy Jude, pray for us. Holy Monica, pray for us. Holy Matthias, pray for us. Holy Matt Talbot, pray for us. *Capitalized words should be intoned or vibrated, such that the sound resonates throughout your body and out into the universe. As we conclude this Hallowmastide Triduum, a time when we’ve prayed with and for the dead, I’ve been spending a lot of time thinking about the Communion of Saints, and the tripartite Church. The earthly Church – called the Church Militant, is connected with two other assemblies: the Church Triumphant, and the Church Suffering. We on earth are Militant because we struggle against the evils of the archons in the world. The Church Triumphant consists of the liberated spirits in the Fullness (Pleroma), those blessed souls traditionally referred to as saints. 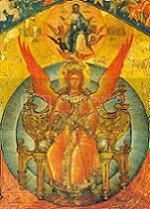 Finally, the Church Suffering is made up of those souls and spirits who are neither in earthly embodiment, nor in the freedom of the Fullness, but in the purgatorial immaterial realms. Joined together, these three assemblies make up what is known as the Communion of Saints. Today being All Souls’ Day, we devote the holy day particularly to praying for the dead. Yesterday, of course, we honored all the saints, both known and unknown. 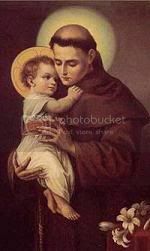 It occurred to me that while we often talk about praying to the saints – which in practice is really praying with the saints – we never talk much about praying for the saints. This may strike some as strange – perhaps even wrong: praying for the saints. Why would saints need our prayers? As I often say, prayer is not bound by space and time. God applies our prayers exactly when and where they are needed. And so if we remember this, praying for the saints seems just as appropriate as praying for the dead – especially when you consider that some of the dead we may have prayed for today could actually be unrecognized saints who are not publicly known or venerated by the Church Militant. By praying for the saints, our prayers may be strengthening the martyr 500 years ago, as he’s marched to his death for his faith. They may be providing grace to the young 3rd century consecrated virgin, whose pagan father wished to marry off for political and/or financial reasons. They may be offering courage the saint who, centuries ago, struggled with his faith or experienced a “dark night of the soul”. We never know how our prayers are used, but as three parts of One Church, we should all do our best to pray for each other. This is why, in my tradition, we hold annual Requiem Masses for the Holy Cathar Martyrs, as well as for the Holy Templar Martyrs. We pray for them, not only in whatever state of existence they may be in now, but also for their final moments of earthly life. 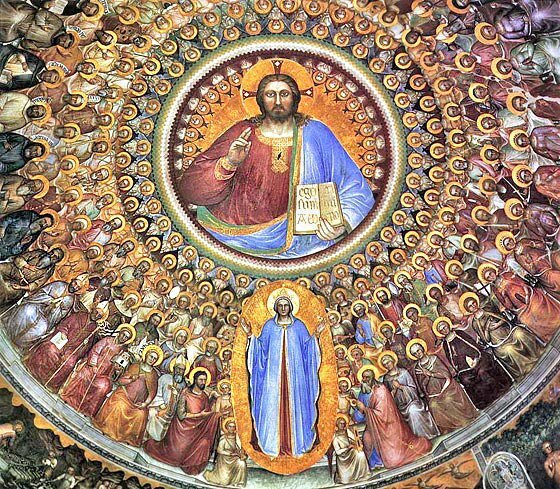 Hallowmastide, my favorite time of year, is perhaps the best time to emphasize the reality of the Communion of Saints. We are all part of the same Church – interior, invisible, secret, and universal; one, holy, catholic, and apostolic. It is important to pray for the departed, no matter who they are; and it is particularly important that just as we ask the saints to pray for us, we also have the piety and love to pray for them. Blessed All Souls’ Day everyone! Hallowtide is right around the corner, commencing with Hallowe’en on Saturday, All Saints’ Day on Sunday, and All Souls’ Day on Monday! As such, let’s take a look at the Hallowmas Triduum, beginning with the ever popular (and rather spooky) Hallowe’en. Nowadays, many Christians (mainly of the fundamentalist/evangelical variety) view Hallowe’en as a satanic or pagan holiday, and encourage “Real True Christians” to avoid it altogether. And while it’s true that many of the secular customs associated with the holiday are rooted in European pagan and folk traditions, the truth is that Hallowe’en is just as firmly rooted in pious Christian tradition as any other holy day. “Hallowe’en” of course comes from “All Hallows’ Even” or “Eve”, which eventually got shortened to Hallow E’en. It is the eve of All Hallows’ Day, commencing at Vespers on the evening of October 31st. “Hallow” is an archaic English word meaning “holy” or “saint”, therefore it may also be called All Saints’ Eve. According to tradition, a day actually begins at sunset prior to the day we would recognize on the calendar. Major Holy Days (and Sundays) are assigned two Vespers offices — so, for example, Vespers I for Assumption Day would be prayed around sunset on August 14th, and Vespers II would be prayed at sunset on the 15th: both beginning and concluding the Holy Day. In the case of Hallowe’en, Christians would gather to pray in honor of the Saints, particularly for those who were not known or publically venerated by the Church with their own individual feast day. Prayers and Masses would continue into the next day, and even today, the Catholic Church recognizes the Solemnity of All Saints as a Holy Day of Obligation. You might ask, how did All Saints’ Day end up on November 1? It was originally celebrated in honor of all the holy martyrs, known and unknown, on May 13. On this day, in 609 or 610 AD, Pope Boniface IV consecrated the Pantheon of Rome to the Blessed Virgin Mary and all martyrs, and ordered an anniversary of the dedication. All Saints Day was eventually moved to November 1 during the reign of Pope Gregory III (731-741) to celebrate the foundation of the an oratory of St. Peter’s for the relics “of the holy apostles and of all saints, martyrs, confessors, or all the just made perfect who are at rest throughout the world”, and the May 13th date feast suppressed. This happened to fall on the Celtic holiday of Samhain (pronounced Sow-en), which had a similar theme to the Roman festival of Lemuria (when restless spirits were propitiated and the dead were honored), but the Celtic holiday was also a harvest festival. Even after conversion to Christianity, the Celtic customs remained popular. The belief that the dead could return on this night to haunt the living lead to the practice of carving jack-o-lanterns (originally out of turnips) and wearing costumes to trick the spirits into leaving the living alone. But the practice of praying still continued, both in Church and in the streets, and this is where the origin of trick-or-treating originated. Christians would bake soul cakes in honor of the dead in Britain and Ireland throughout the Middle Ages, usually filled with allspice, nutmeg, cinnamon, ginger, raisins, or currants. Before baking, these were marked with the sign of the cross to signify that they were alms. Children, widows, and beggars would go out “soulling”, that is ritually begging for cakes door to door, and reciting prayers for the dead. Each cake given represented a prayer. All these traditions were brought over to America by Irish immigrants, and thus Hallowe’en became a popular holiday in the U.S. In traditions that do not recognize the Saints, All Saints’ Day is generally ignored. If it is celebrated, it often celebrates all Christians — the living and the dead. These traditions also generally do not believe the praying for the dead is efficaceous, and therefore the following Holy Day dedicated to All Souls gets tossed out. While All Saints’ Day and its Eve are dedicated to all the saints, both known and unknown, All Souls’ Day on November 2nd is focused on praying for the departed. We pray for the repose of our loved ones: the friends, family, mentors, and clergy who have passed on but are never forgotten. We also pray for those forgotten souls who have no one to pray for them. We visit cemeteries, leaving flowers and candles; and, hopefully, we remember our own mortality so that we can make the best of our lives here on earth. Yes, I personally love all things spooky, and it’s fun to dress up for Hallowe’en. But for me, and many Christians Gnostic or otherwise, this three-day period is an important triduum in which we the Church Militant have the opportunity to pray with and for the Church Triumphant and the Church Suffering. As I always like to say, prayer is not limited by space and time, and the prayers we say today may be assisting a martyr as they’re lead to their death centuries in the past, or aiding someone on their death bed who has no one to be with them as they depart from this world and on to the next. We may not know how God chooses to apply our prayers, but we can be confident that through His mercy, our prayers are always effacaceous! O merciful God, take pity on those souls who have no particular friends and intercessors to recommend them to Thee, who, either through negligence or through length of time are forgotten by their friends and by all. Remember them, O Lord, and remember Thine own mercy, when others forget to appeal to it. Let not one soul ever be parted from Thee; may they find repose in the Eternal Fullness, and may light perpetual shine upon them. Amen. I’ve found that it is often surprising to our more mainstream brothers and sisters in Christ that Gnostics would celebrate the Eucharist, much less that we would recognize the Real Presence of Christ in this most glorious Sacrament. After all, Gnostics reject matter as evil, right? I’ll put aside being an apologist for a moment, and simply say this: No, matter is not evil – but it is imperfect. That’s not to say that there is nothing good about the material world. We know that the world is filled with wonderful things; awe-inspiring beauty that sometimes allows us to see through the veil and catch a glimpse of the Eternal. But as St. Paul says, “Now, we see as through a glass, darkly”. What we see and experience with our physical senses is but a pale reflection compared to the beauty and splendor of the Pleroma. So what of the Eucharist? If we are, as Gnostics, to try and transcend the limitations of matter, why use physical substances for the Sacraments? For that matter, why have Sacraments at all? For some insight, let’s consult the Gospel of Philip – a book most likely composed by the Holy Valentinus, and which represents the earliest Sacramental text in Christian history. In this book we read: “The Lord did everything in a Mystery: a Baptism, and Chrism, and a Eucharist, and a Redemption, and a Bride-Chamber. He said, I came to make the things below like the things above, and the things outside like those inside. I came to unite them in one place.” These Mysteries, all of which likely involved physical substances and ritual actions, serve to break down the barrier which separates us from our divine nature, and draws us closer and closer to our Source and the perfection of the Pleroma. While the exact form of the Mystery of the Bride-Chamber has been lost to history, and the Mysteries of Baptism and Chrism may only be received once, the Mystery of the Eucharist can and should be received as frequently as possible. The Gospel of Philip states very clearly: “The Eucharist is Jesus.” No other scripture, biblical or otherwise, puts it so bluntly. The ancient Gnostics, or at least the Valentinian sect, clearly believed in the Real Presence of Christ in the Eucharist. It is because Christ is present in the Eucharist that this Sacrament helps to strengthen us and the divine spark within, uniting our lower nature more closely to our higher nature, that the Christ within us may be revealed – making the things below like the things above. As I’ve said, we should frequent the Eucharist. To not take advantage of the great gift would be to scorn the words of Christ: “If you do not eat of my flesh and drink of my blood, you will have no life in you.” But how should we prepare for it? We prepare to receive the Sacrament through prayer and sincere contrition that purifies us of the stain of our faults, weaknesses, and imperfections. Otherwise, as St. Paul said, we eat and drink our own judgment and condemnation. 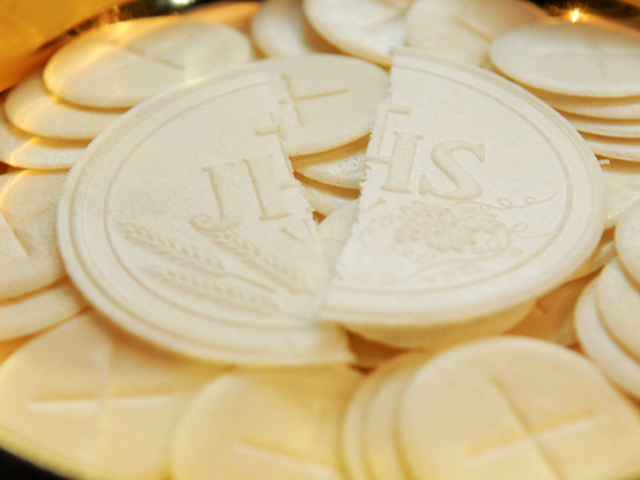 I would encourage my readers all to frequent the Holy Eucharist – daily, if possible! If you do not have a Gnostic Church nearby, seek out other Sacramental options. Churches of the Independent Sacramental Movement are excellent options, the Liberal Catholic Church shares much in common with us, and many Gnostics have found themselves comfortable within the Episcopalian and Anglo-Catholic traditions. Even Roman Catholicism may work for some! But wherever you choose to go, seek out Christ in the Eucharist. And to help you prepare, here are some Communion prayers to help you both prepare before receiving the Eucharist, and to give thanks afterward. Antiphon. O sacred banquet, in which Christ is received, the memory of His Passion is renewed, the mind is filled with grace, and a pledge of future glory is given to us. ℣. Thou didst give them bread from heaven. ℟. Containing within itself all sweetness. Let us pray. O God, Who under a wonderful Sacrament hast left us a memorial of Thy great descent into the limitations of matter; grant us, we beseech Thee, so to venerate the Sacred Mysteries of Thy Body and Blood, that we may ever feel within ourselves the fruit of Thy redemption and be brought to the Gnosis of Life, Liberty, Love, and Light. Through Christ our indwelling Lord. Amen. Almighty and eternal God, behold, I approach the sacrament of Thine alone-begotten Son, Our Lord the Christ. I approach as one who is sick to the physician of life, as one unclean to the fountain of mercy, as one blind to the light of eternal brightness, as one poor and needy to the Lord of heaven and earth. Therefore I beseech Thee, of Thine infinite goodness, to heal my sickness, to wash away my filth, to enlighten my blindness, to enrich my poverty, and to clothe my nakedness, that I may receive the Bread of Angels, the King of Kings, and the Lord of Lords with such reverence and humility, with such contrition and devotion, with such purity and faith, with such purpose and intention, as may conduce to the salvation of my soul. Grant, I beseech Thee, that I may receive not only the sacrament of the Body and Blood of our Lord, but also the fruit and virtue of this sacrament. O most High God, grant me so to receive the Body of Thine alone-begotten Son, our Lord the Christ, that I may be found worthy to be incorporated with His mystical body, numbered among His members. O most loving Father, grant that I may at length be brought to a place of refreshment, a blessed tranquility, and the splendor of Thy Gnosis, that I may enter into the eternal peace of the Fullness with Christ, Thy beloved Son, Whom now on my pilgrimage I am about to receive under the sacramental veils; Who liveth and reigneth with Thee in the unity of the Holy Spirit, One God, for ever and ever. Amen. Angels, Archangels, Thrones, Dominions, Princedoms, heavenly Virtues, Powers, Cherubim and Seraphim; all Saints of God, holy men and women, and for you especially my patrons _____: deign to intercede for me that I may be worthy to offer this Sacrifice to almighty God, to the praise and glory of His name, for my own welfare and also that of all His holy Church. Amen. Have mercy on me, O God, according to thy great mercy. And according to the multitude of thy tender mercies blot out my iniquity. Wash me yet more from my iniquity, and cleanse me from my sin. For I know my iniquity, and my sin is always before me. To thee only have I sinned, and have done evil before thee: that thou mayest be justified in thy words and mayest overcome when thou art judged. For behold I was conceived in iniquities; and in sins did my mother conceive me. For behold thou hast loved truth: the uncertain and hidden things of thy wisdom thou hast made manifest to me. Thou shalt sprinkle me with hyssop, and I shall be cleansed: thou shalt wash me, and I shall be made whiter than snow. To my hearing thou shalt give joy and gladness: and the bones that have been humbled shall rejoice. Turn away thy face from my sins, and blot out all my iniquities. Create a clean heart in me, O God: and renew a right spirit within me. Cast me not away from thy face; and take not thy holy spirit from me. Restore unto me the joy of thy salvation, and strengthen me with a perfect spirit. I will teach the unjust thy ways: and the wicked shall be converted to thee. Deliver me from blood, O God, thou God of my salvation: and my tongue shall extol thy justice. O Lord, thou wilt open my lips: and my mouth shall declare thy praise. For if thou hadst desired sacrifice, I would indeed have given it: with burnt offerings thou wilt not be delighted. A sacrifice to God is an afflicted spirit: a contrite and humbled heart, O God, thou wilt not despise. Deal favorably, O Lord, in thy good will with Sion; that the walls of Jerusalem may be built up. Then shalt thou accept the sacrifice of justice, oblations and whole burnt offerings: then shall they lay calves upon thy altar. We thank Thee, Holy Father, for Thy holy Name which Thou hast made to dwell in our hearts, and for the knowledge, faith, and immortality which Thou hast made known to us through Thy Son, our Lord the Christ; glory to Thee forever. Thou, O Lord Almighty, hast fashioned and emanated all things for the sake of Thy Name, and hast given food and drink to all for their enjoyment, so that they might return thanks to Thee. Upon us, however, Thou hast bestowed spiritual food and drink and eternal life through Thy Son. Above all, we give Thee thanks, for Thou art almighty; glory unto Thee forever. Remember, O Lord, Thy Church. Deliver it from all evil and perfect in Thy love. Gather it from the four winds, sanctified in Thy kingdom which Thou hast prepared for it, for Thine is the power and the glory forever. Let grace come and this world pass away. Hosanna to the Son of David. If anyone is holy, let him come. If not, let him be healed. Maranatha! Amen. All ye waters above the heavens, bless the Lord. All ye hosts of the Lord; bless the Lord. All ye winds, bless the Lord. All ye birds of the air, bless the Lord. Praise ye the Lord in his holy places: praise ye him in the firmament of his power. Praise ye him for his mighty acts: praise ye him according to the multitude of his greatness. Praise him with sound of trumpet: praise him with psaltery and harp. Praise him with timbrel and choir: praise him with strings and organs. Praise him on high sounding cymbals: praise him on cymbals of joy: let every spirit praise the Lord. Alleluia. Because today we live in a society in which spurious realities are manufactured by the media, by governments, by big corporations, by religious groups, political groups… So I ask, in my writing, What is real? Because unceasingly we are bombarded with pseudo-realities manufactured by very sophisticated people using very sophisticated electronic mechanisms. I do not distrust their motives; I distrust their power. They have a lot of it. And it is an astonishing power: that of creating whole universes, universes of the mind. I ought to know. I do the same thing. Blessed Ash Wednesday everyone! Having spent the last three weeks focusing on the transforming power of the Holy Spirit in our commemorations, today marks the beginning of a Lent. For Gnostics this marks a period of purification, introspection, and self-examination. Beginning 40 days before Easter Sunday, we spend the days of this season examining ourselves and our lives, burning off the dross matter, and preparing for the resurrection of the Divine Light at Easter. Forty days, of course, has significance in the mythic story of Jesus Christ, who spent 40 days fasting in the wilderness before commencing His public ministry, and spent 40 hours in the tomb before His glorious resurrection. If we should choose to give up something for Lent, it’s wise to begin by examining things in our lives that draw our attention away from our true nature as sons and daughters of God, and that spark of Divine Light we all possess: the indwelling Christ. Many people give up sweets or caffeine, and if these things are actually drawing you away from God, then go for it! But if we dig deeper, we may find that the true cause of our separation are things like anger, desire, laziness. When we’ve figured out the cause, we can then figure out what to do about it — it may not involve giving something up at all, but rather taking on a practice. We may choose to add to our regular devotional practices, or even begin a new one if we’ve found ourselves making excuses for finding time for prayer. 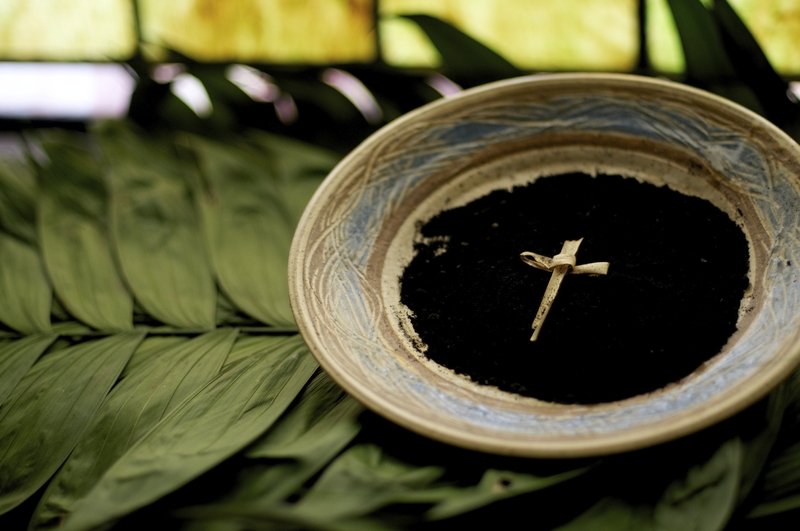 Whatever we choose to give up or take on during Lent should be based on careful self-examination, so that when the 40 days are over, we find ourselves in a better position than we were before: closer to God, and closer to our neighbors and loved ones. It’s my prayer that this Lenten season will be a time of powerful transformation for you all, as I hope it will be for myself. Pax vobiscum!